$0.075 per common share to raise aggregate gross proceeds of up to approximately $786,000 (the “Financing”). Proceeds from the Financing will be used to fund the Proposed Acquisition, complete initial exploration on the PLS, and for corporate and general working capital. 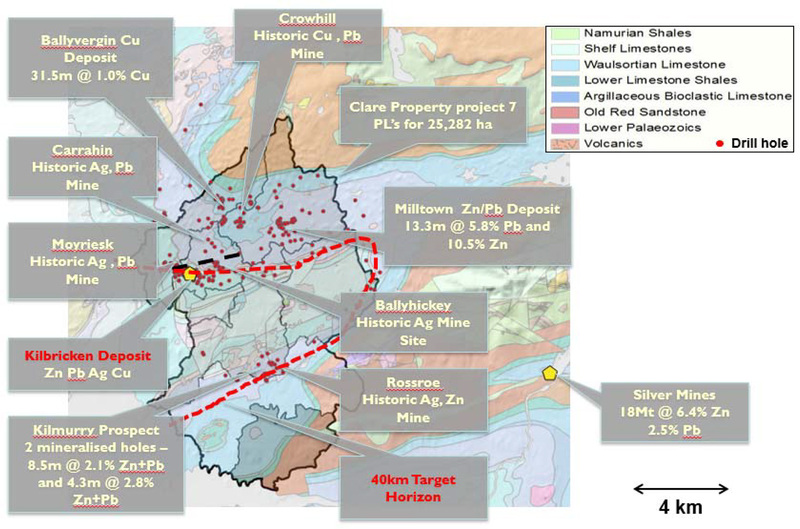 The Clare zinc-silver-lead-copper property (the “Clare Property”) consists of 7 PLs for 25,282 hectares located in County Clare, Ireland, the western extent of which lies 1.5 km from the town of Ennis. PLs 3509, 3640, 3643, 3679, 3787, 3788 and 3789, issued by the Exploration and Mining Division (“EMD”) of the Department of Communications, Climate Action and Environment are 100% owned by Hannan Ireland. The Irish base metal ore field is one of the world’s best mineralized zinc provinces and is considered highly prospective for new zinc discoveries. In 2015 Ireland was the world’s 10th largest zinc producing nation with 230,000 tonnes produced. The Clare Property is underlain by an open syncline comprised of Upper Devonian (sandstones) to Lower Carboniferous (sandstones and limestones) rocks. The Lower Carboniferous sequence includes the Waulsortian Limestone, which hosts most of Ireland’s important zinc-lead sulphide deposits, such as the Lisheen and Galmoy deposits. The Clare Property has a rich history of small scale 19th century mining (Figure 1). Modern exploration efforts from the mid-1960’s, by Irish Base Metals, Rio-Finex, Central Mining Finance, Billiton and Belmore Resources Ltd followed up some of these earlier historic mines. There are two known Waulsortian-hosted zinc-lead deposits on the property, the flagship Kilbricken prospect (see below) and the smaller Milltown prospect, where Belmore Resources Ltd (“Belmore”) intersected 13.3m @ 5.8% Pb and 10.5% Zn from 45.4 metres in drill hole 3788/19 in 1994. The lowest part of the sequence is also prospective for copper-silver mineralization and contains numerous copper showings, most notable at Ballyvergin where Irish Base Metals drilled hole BV11 which intersected 31.5m @ 1.0% Cu from 51.7 metres in the 1960s. In 2008, Belmore, a private Irish company, drill tested the base of the Waulsortian Limestone beneath near-surface sulphidic and calcite veined shelf carbonates at the historic Kilbricken lead mine. The discovery drillhole at Kilbricken, DH04, intersected 10m @ 13.8% Zn, 5.5% Pb, 0.08% Cu, 62.8g/t Ag from 448.1 metres at the target base of Waulsortian Limestone. After this initial discovery, Lundin Mining Exploration Limited (“Lundin”), a subsidiary of Lundin Mining Corporation (TSX:LUN), joint ventured Kilbricken and wider tenure package from Belmore. In 2011, Lundin purchased 100% of Belmore. Drilling by Lundin from 2009 to 2012 continued to intersect sulphide mineralization in the hanging wall of a the Main Kilbricken fault. Significant intersections from Lundin’s drilling programs are shown in Table 1. The initial discovery area, the Zinc Zone, has been drilled within an area of 950 metres by 400 metres, between 360-440 metres vertically below surface. Significant drill results in this zone include DH46: 20.5m @ 7.5% Zn, 9.9% Pb, 0.07% Cu, 74.6g/t Ag from 415.3m and DH06: 21.3m @ 11% Zn, 4.8% Pb, 0.06% Cu, 94.4g/t Ag from 441.9m. 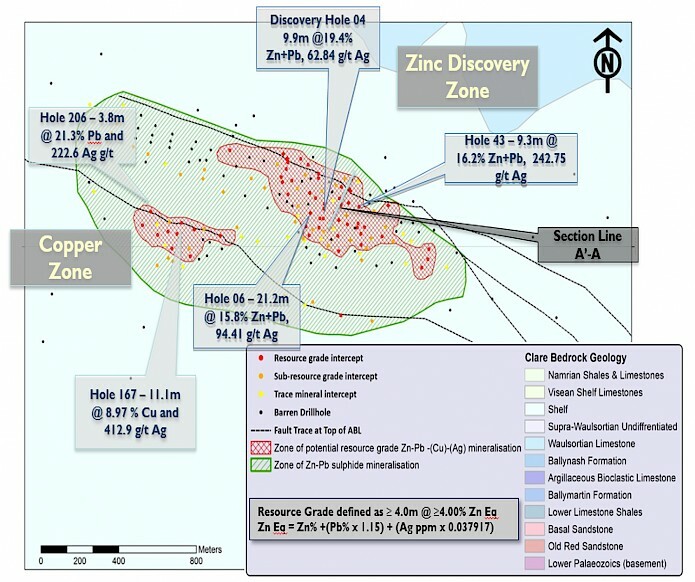 The Copper Zone was found later in the Lundin program and is drilled within an area of 400 metres by 200 metres, between 520-670 metres vertically below surface. Significant drill resultsin the Copper Zone includes DH167: 4.5m @ 0.8% Zn, 2.6% Pb, 18.91% Cu, 867.6g/t Ag from 616. Lundin completed significant work on the property. A total of 216 drill holes for 116,230 metres were drilled by Lundin in the Kilbricken area. Lundin also undertook regional exploration in the remainder of the Clare Property, largely focussed on other Waulsortian-hosted zinc-lead prospects. Lundin carried out 616 metres of drilling at the Ballyvergin prospect with the objective of discovering additional zones of copper-silver mineralization. Lundin drilled a total of 2,370 metres on the Kilmurry Project, located within the Clare project area 26 kilometres along strike from Kilbricken. In addition, significant surface geochemical and multiple geophysical surveys have been undertaken by Lundin and previous operators on the Clare project area. Of particular note are a 3D seismic survey over the main Kilbricken mineralization in 2011, and 2D seismic survey conducted in 2012 that consisted of 8 traverses (3-3.5 km long) over a total 10 kilometre strike length, spaced between 1-2 kilometre across the regional Kilbricken extensions. Massive sulphide mineralization at Kilbricken most commonly consists of early massive-textured, fine- grained pyrite, galena and sphalerite cross-cut by coarse-grained sphalerite and galena, resembling sulphides found in the overlying veins. It differs from most other Irish zinc/lead prospects in that it is rich in silver, most commonly associated with galena-rich zones. 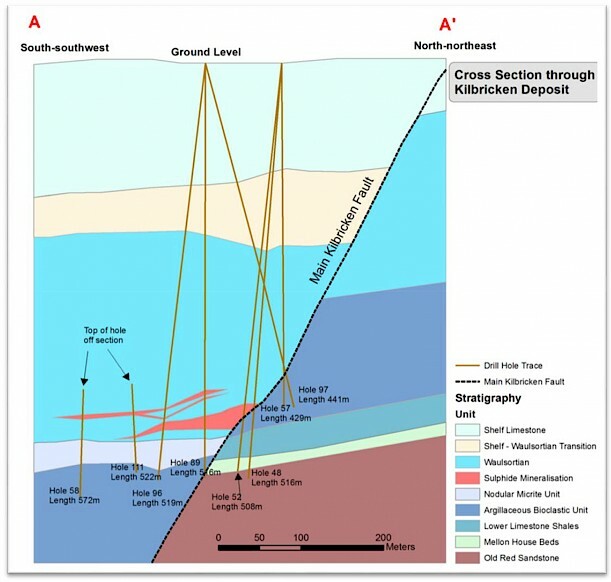 The Kilbricken Project is considered by Hannan Ireland to be highly prospective for the discovery and potential development of zinc-lead-silver suphide deposits. The Kilbricken deposit is open along strike and down-dip. Search for new discoveries and extensions of known mineralization in the well-endowed 25,282 hectare regionalblock. A detailed 3D compilation of geological and seismic datasets to create a basinal to local scale structural and stratigraphic model is now underway, with concurrent re-interpretation of 2D and 3D seismic data. Hannan Ireland then plans to outline the first resource model on the property. An initial budget of CDN$200,000 is planned, with follow up drilling when further capital has been raised. The Company has entered into the Agreement with the principals of Hannan Canada, Michael Hudson and Mark Saxon, to acquire all of the issued and outstanding shares of Hannan Canada at cost, being nominal consideration, as a means to acquire a 100% interest in Hannan Ireland’s rights to the PLs. The Company will assume all obligations of Hannan Ireland. The PLs were assigned to Hannan Ireland, and were acquired, effective September 21, 2016, pursuant to an Assignment Agreement (the “AA”) between the Irish Minister for Communications, Climate Action and Environment, Hannan Ireland and Lundin. Under a separate Asset Purchase Agreement (the “APA”), dated June 3, 2016, Hannan Ireland purchased all exploration data associated with the PLs from Lundin for a cash payment of US$150,000. Hannan Ireland must make two additional cash payments to Lundin Mining of US$425,000 each on September 21, 2017 and March 21, 2018. Lundin retained a 2% net smelter return royalty on all sales of mineral products extracted from the area of land subject to the PLs, subject to a 0.5% buy back right of Hannan Ireland for US$5,000,000, which must be exercised within one year from the date of commercial production. Hannan Ireland is required to pay Lundin a one-time bonus payment of US$5,000,000 within the earlier of (i) Hannan Ireland’s decision to proceed with mine construction or (ii) within 90 days of the establishment of a commercial financing to finance capital costs for mine construction. Additionally, Hannan Ireland will be required to pay a one-time cash fee of US$2,000,000 less cash payments already made to Lundin, if it transfers its rights to the PLs to an arm’s length party (which excludes Mitchell) for US$10,000,000 or greater within 18 months of the execution of the APA. On the closing of the Proposed Acquisition, it is expected that Michael Hudson will be appointed the Chief Executive Officer of the Company and will join existing directors Nick DeMare, Harvey Lim, David Henstridge and Michael Iannacone on the Company’s board of directors. developed exploration to pre-feasibility projects in Pakistan, Australia, Peru, Argentina, Mexico, Finland, Spain, Portugal, Sweden and Ireland for major and junior mining companies. He was an integral team member for the discovery of the Portia gold deposit in the Olary district of South Australia, the Duddar Pb-Zn mine in Pakistan, the Norra Karr REE deposit in Sweden and the Rompas-Rajapalot gold property in Finland. Since 2004 has headed Mawson Resources Ltd (TSX:MAW) as founding Chairman, CEO and Director. He is also a founder and Chairman of Leading Edge Materials (TSXV:LEM) a critical metals company in Sweden. He is a Fellow of the Australasian Institute of Mining and Metallurgy and Member of both the Society for Economic Geologists and Australian Institute of Geoscientists. The Company also proposes to change its name to “Hannan Metals Ltd.” on the closing of the Proposed Acquisition. Completion of the Proposed Acquisition is subject to a number of standard conditions precedent, including, without limitation, the completion of satisfactory due diligence on the PLs by the Company, the completion of the Financing and the receipt of all regulatory approvals, including the acceptance of the TSX Venture Exchange (the “Exchange”). In order to obtain requisite acceptance from the Exchange with respect to the Acquisition, the Company will have to satisfy the Exchange requirements, which include delivery of an independent technical report in respect of the PLs prepared in accordance with National Instrument 43-101 Standards of Disclosure for Mineral Projects (“NI 43-101”). Mr. David Henstridge, a Fellow of the Australasian Institute of Mining Metallurgy the Company’s qualified person as defined by NI 43-101, has reviewed and approved the contents of this press release. accurate, and actual results and future events could differ materially from those anticipated in such statements. The Company undertakes no obligation to update forward-looking statements if circumstances or management’s estimates or opinions should change except as required by applicable securities laws. The reader is cautioned not to place undue reliance on forward-looking statements. Figure 1: Plan view of the Clare Property with historic mines and recent exploration discoveries. The red dotted lines form the +40km trend for extensions of the “base of reef” host position of the Kilbricken mineralization. Figure 3: Typical Stylized Cross Section Through the Kilbricken Prospect.